Roland, the last Gunslinger, is on the trail of The Man in Black. Travelling across the endless desert he meets a tempting woman names Alice and Jake, a kid from New York. As he gets closer to the mysterious Dark Tower and finally catching up the Man in Black, Roland faces the difficult choice between damnation and salvation. 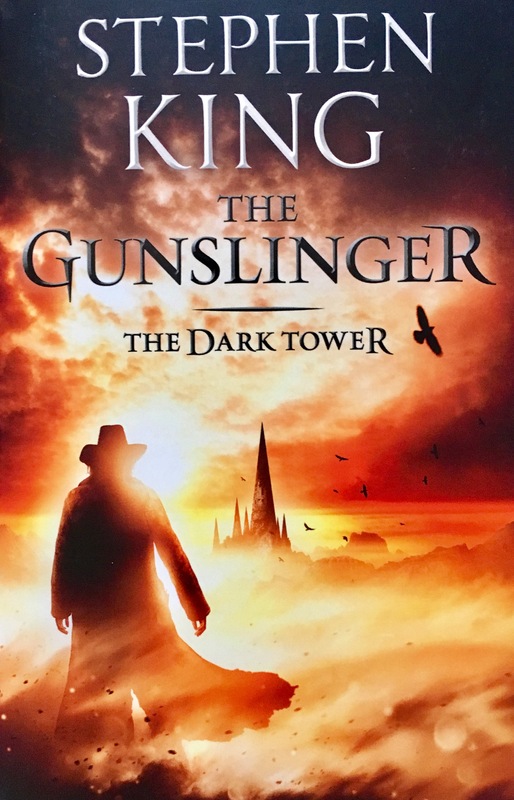 The Gunslinger is the first book in King’s epic Dark Tower series so I lot of the things I didn’t really like can probably be put down to that – like the fact there’s a lot of set up and not a lot of pay off. Also the book is quite slow due to all the world-building and learning more of Roland’s backstory, it’s stuff that’s often a mixture of interesting and kind of boring. When you think about it, not a lot really happens in The Gunslinger. It has a bit of a slow start as you get used to the setting and pace but it’s Roland and his quest that really pulled me into the story. The story itself jumps back and forth in time between Roland chasing down The Man in Black and Roland’s childhood and training to become a Gunslinger. When something does happen, it’s often explosive. When Roland needs to start shooting people or strange mutant creatures, it’s gripping stuff. You can easily visualise Roland taking down his enemies and they are moments where you can actually see how talented he is, after hearing whispers of the greatness of the Gunslingers. The Gunslinger is quite an atmospheric book. The desert, and this whole world Roland and The Man in Black live in becomes its own character as you learn more about it. It’s an interesting setting that’s like a distorted reflection of our own which makes it eerie and strangely captivating. While not a lot happened in The Gunslinger, and some stuff did confuse me, I liked it enough that I will be continuing with the series. 4/5. There is definitely a lot of payoff in continuing the series that makes the slow start worth the read. I am curious as to which version of the book you read; there is the original 1982 version and then a 2003 rewrite and expansion that places connections to the later books and creates a more cohesive narrative. Great review and I can’t wait to read what you think of the books that follow! Thanks for the lovely feedback. The edition I read was the 2012 edition from Hodder and I’m not sure which version that was. Great Review! I loved reading the Dark Tower series. That being said The Gunslinger took me about 2 years to finish, but when I moved on the rest of the series I finished them super fast. The other 7 books (I include Wind Through The Key Hole) will help piece together any confusion. I really hope you enjoy the series, and I look forward to future reviews! Thank you! I am looking forward to reading the rest of the series though I might not continue till next year as there’s so many books I want to read before this year is over, never mind accidentally getting a new series to read!